LOVINGTON, N.M. – J.W. Harris is a man on a mission. Last season, the Mullin, Texas, cowboy rode his way to a fourth bull riding world championship, earning nearly $253,000 for the season. This year, he’s focused on gold buckle No. 5, which is why he will be part of all the action at the Lea County Fair and Rodeo – first with the Lea County Xtreme Bulls, which begins at 7:30 p.m. Tuesday, Aug. 5, then during the rodeo, which is scheduled for 7:30 p.m. Wednesday, Aug. 6-Saturday, Aug. 9, at Jake McClure Arena. It’s a hectic week of non-stop action for one of the greatest bull riders in ProRodeo history. “You can win a lot of money out of Lovington,” said Harris, who in early July was No. 2 in the world standings. “The last two year I finished pretty good in the bull riding and got thrown off my short-round bull at 7.9 seconds both times. You still win a lot of money at the bull riding, but then you turn right back around and have a chance to win money at the rodeo, too. Harris knows what it takes to make money, especially in southeastern New Mexico. 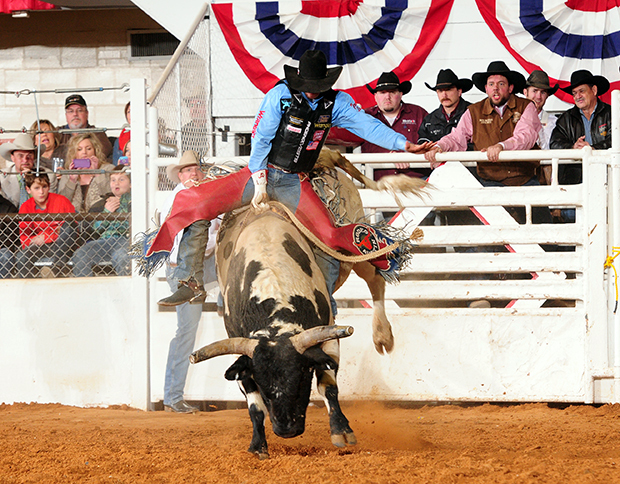 Over the last two years, Harris has earned $9,362 at the Lea County Xtreme Bulls. Just imagine what could have happened had he finished off the final one-tenth of a second during the championship round. “Doing well is always good at the Xtreme Bulls because they pay so well, depending on how well you do in each of the rounds,” said Harris, who has earned more than $45,000 in Xtreme Bulls this season, more than half of his earnings as of July 7. The rodeo season runs Oct. 1-Sept. 30, and only the cowboys among the top 15 in earnings at the conclusion of the season earn the right to compete at the Wrangler National Finals Rodeo, which takes place at Las Vegas in December. Having big-money opportunities in August is critical for the contestants hoping to secure their spot at the year-end championship event. It takes more than great cowboys to find success at that level; it takes great bulls, too. That’s where Pete Carr Pro Rodeo comes in. Not only will the Dallas-based livestock contractor provide some of the greatest bulls in the game at the Xtreme Bulls event, Carr also solicits other top-caliber bulls from other contractors to be in Lovington for the challenge. That’s why world champions and others from ProRodeo’s elite will take any means possible to be in Lovington for the event. That’s what organizers have learned over the past two seasons and why Xtreme Bulls returns to town again this August. “We thought it was an event that would go well with our fair and rodeo,” said Greg Massey, chairman of the rodeo committee. “We think the people in this area would really enjoy it. Xtreme Bulls is a high-energy event that people in this area would turn out for.